Quaternary climate change is one of the most complex, yet relevant issues facing researchers and educators today. Not only is the topic scientifically complex, but there are economic, social and political ramifications as well. This site allows educators to locate and use the best resources for teaching about Earth's climate system and the changing climate over the past one million years. Here you will find climate data, visualizations, teaching activities, workshops and more. Malaspina Glacier, AK. 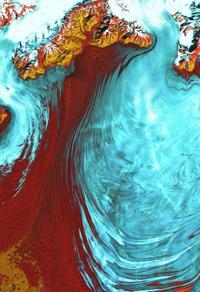 Image courtesy of NASA Landsat Project Science Office and USGS National Center for EROS. Learn to set effective course goals from the Course Design Tutorial. You can also browse course descriptions and syllabi from your colleagues to gauge the range of climate change courses currently offered. Because climate change is a complex topic with scientific, policy, and societal components, the selection of an appropriate pedagogic approach is especially important. There are many strategies that can be used to achieve a desired learning outcome. Teaching Controversial Environmental Issues from the On the Cutting Edge Affective Domain module discusses how topics can be influenced by students' values, attitudes and pre-held beliefs, and presents strategies to successfully present these topics. Teaching with Data, Simulations and Models allows students to work with specific data sets to understand aspects of the climate system. Teaching with Models from Starting Point, yields opportunities for students to observe the effects of changes to Earth's atmosphere. TheCutting Edge climate models workshop produced a page of resources for teaching about climate models. Teaching Climate Literacy from CLEAN, encourages an intrinsic understanding of the climate system and its components, including the human impacts on climate. See more pedagogies for teaching climate on the Climate Site Guide. A piece of ice from the Mt. Moulten ice core in West Antarctica. 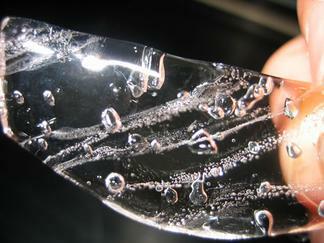 This ice is 45,000 years old, and the gas bubbles are plainly visible. Courses descriptions about climatology and climate change, including syllabi and course goals. Teaching activities contributed by faculty members including classroom activities, lab exercises, problem sets, and more. Teaching activity ideas, including ice core data and paleoclimate collections have been developed at various climate change workshops. Visualization collections for teaching about Earth's climate and climate change. Collections include animations, photos, and interactive imagery and are sorted by topic. Selected resources for teaching climate change including research summaries, data sets, graphics, and carbon footprint calculators. You can also browse additional web resources. Carbon Footprint Collection - find several strategies and examples for teaching about carbon footprints. Climate Proxies from the Microbial Life Educational Resources collection discuss teaching the science behind paleoclimatology. Communicating Global Climate Change: Using Debate to Engage Integrative Learning. This series of video clips from MERLOT/ELIXR demonstrates the use of debate as a strategy for engaging student with the issues surrounding climate change. Project materials, timelines and PowerPoint slides are also included. 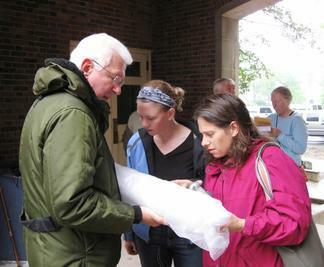 Workshop participants examine an ice core at the 2008 Teaching Climate Change with Ice Core Data workshop. Provenance: Photo by Dallas Rhodes. 2012 Teaching Climate Change: Insight from Large Lakes Workshop: Held at the University of Minnesota-Duluth in association with the 2012 AMQUA Biennial Meeting. Co-sponsored by the U.S. National Committee for the International Union for Quaternary Research and the American Quaternary Association . View the workshop program to download talks and supporting materials. 2011 Climate and Energy Webinar and Book Club Series: Monthly webinars addressing a range of topics in climate and energy. Held once a month from November 2010 through May 2011. 2010 Teaching About Complex Systems Using the STELLA Modeling Software: This meeting, held in December of 2010, discussed the benefits of using simple modelling software to teach complex systems. View the workshop program for presentations and associated materials. 2010 Teaching About Earth's Climate Using Data and Models Workshop part of the Cutting Edge Follow-On Workshop Program An online workshop held October, 2010 designed to help faculty enhance their teaching about the climate system by incorporating numerical models. View the workshop program to view presentations and materials. 2010 Teaching Climate Change from the Geologic Record Workshop In association with the 2010 AMQUA Biennial Meeting , co-Sponsored by AMQUA/USNC-INQUA. University of Wyoming - Laramie, August 10-12, 2010. View the workshop program for workshop presentations. 2008 Teaching Climate Change with Ice Core Data Workshop: In association with the 2008 AMQUA Biennial Meeting, co-Sponsored by AMQUA/USNC-INQUA. Penn State University, June 2-4, 2008. The workshop program has presentations and materials for download. 2006 Teaching Climate Change: Lessons from the Past Workshop: In association with the 2006 AMQUA Biennial Meeting, co-Sponsored by AMQUA/USNC-INQUA. Montana State University, Bozeman, MT, August 14 - 15, 2006. View workshop program for presentations. Contribute materials: Do you have teaching materials, references or web sites you'd like to tell us about? Read the email list discussion, join the email list or unsubscribe using the climate change email list.